It is now well established that, for many test targets, vertical and horizontal orientations yield higher visual acuities than oblique orientations. 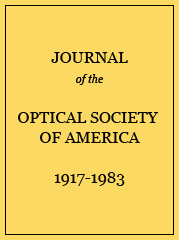 In order to assess the role of the optics of the eye in this effect, focusing errors of the eye were bypassed by using as the measure of resolving capacity the modulation sensitivity for sinusoidal interference fringes formed on the retina. The modulation sensitivity for vertical and horizontal orientations of the fringes was greater than for oblique orientations for a wide range of spatial frequencies. A similar orientation preference was found for the cut-off spatial frequencies. Measurements of the modulation sensitivity at 15° orientation intervals indicated that maxima in sensitivity were spaced at 90° intervals. Since the effects of the optics of the eye have been eliminated, the origin of meridional variations in acuity must lie in the retina and/or higher visual pathways.